Eight cars lined up for the 2018 3x3H Proto Series races at the Dubai Autodrome last weekend, all three victories going the way of British Ginetta G57 customer team Simpson Motorsport. The team’s #6 G57 of Mike Simpson, John Corbett, Neale Muston and Jordan Sanders won the opening race re-taking the lead from the #44 Graff Ligier JS P3 of Michal Broniszewski and Giacomo Piccini on the penultimate lap. 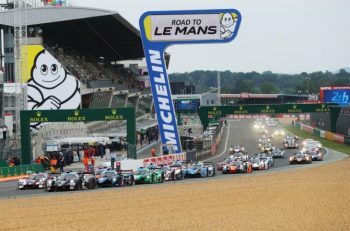 Having taken pole position earlier that afternoon, the Simpson Motorsport Ginetta would make a slow start to the race, losing it lead in the process, and time on-track after its first pit stop, allowing the Graff Ligier to hit the front. A late charge though meant it was Jordan Sanders rather than Michal Broniszewski who crossed the line first after 82 laps of the 5.39km Dubai Autodrome. Graff would at least walk away with P3 class victory. Early contenders for victory also included the Speedworks Motorsport Ligier JS P3 (#22, Jack Butel, Kay van Berlo, Konstantin Gugkaev) only for engine woes to scupper its process. The British-based Ligier was running comfortably at the front before a broken driveshaft brought it’s run to a screeching halt. Simpson Motorsport would suffer a similar setback with its second Ginetta entry (#4, Steve Tandy, Simon Murray), which was officially retired shortly before qualifying with a broken chassis. The SPIRIT OF RACE Ligier JS P3 of Piergiuseppe Perazzini Kriton Lendoudis, Marco Cioci and Rui Aguas would finish second in the P3 class and 5th overall, albeit half a dozen laps further back after issues for Greek driver Lendoudis saw the Ligier swap ends several times on-track before drawing to a halt completely for several minutes at half-distance. Issues for both P3 entries therefore meant the CN1-winning Krafft Racing Norma M20 FC of Daniel Kirmann, François Kirmann and Marc Vives completed the podium, cementing the team a second prototype victory in Dubai after last year’s ‘exhibition’ races. The sister entry (#97, Max Bortolami, David Cristini and Régis Tref) would finish its race, without power, on the main straight, but would still be classified sixth. Then on Sunday, Simpson’s G57 continued to find the top step of the podium, winning Races 2 and 3. The #6 Simpson Motorsport Ginetta G57 of Mike Simpson, John Corbett and Neale Muston took its second win of the season opener in dramatic style, snatching victory on the last corner of the last lap of the final race of the weekend. In the closing stages of race three, victory had looked set to go to the sister Simpson Motorsport Ginetta G57 (#4, Jordan Sanders, Simon Murray and Charlie Robertson), which had led comfortably throughout the final hour despite losing time during the mid-race pit stops. 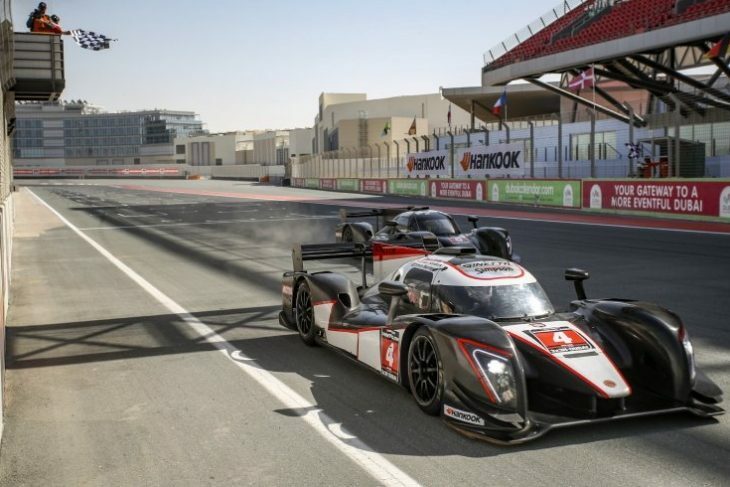 The #4 prototype though would crawl to a halt on the main straight of the 5.39km Dubai Autodrome after running out of fuel, and would ultimately be classified second. In P3, the Speedworks Motorsport Ligier JS P3 of Jack Butel, Kay van Berlo and Konstantin Gugkaev walked away with a pair of class wins, having led both races outright intermittently. Despite an errant spin in the closing stages of race three, the British-based Ligier would also round out the overall podium in both races. Further back in P3, the Graff Ligier JS P3 secured the runners-up spot in both races, the only two-driver line-up in the field finishing 6th overall in the second race and improving to finish 4th overall in race three. 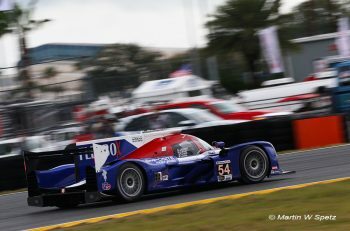 Following its second place finish in-class on Saturday, the SPIRIT OF RACE Ligier JS P3 rounded out the P3 podium in both races on Sunday, despite day-long wheel and understeer problems. In CN1, the Krafft Racing Norma M20 FCs shared the class spoils on Sunday, with the #97 taking the class win in race two in a nail-biting finish that saw both Normas cross the line barely one tenth of a second apart. In race three, the sister #98 entry of Daniel Kirmann, François Kirmann and Marc Vives took its second class win of the weekend, but could not replicate its success from race one, in which the Norma finished third overall and on the outright podium. On home turf, the AUH Motorsport Radical SR3 RSX rounded out the CN1 class podiums in both races. The 24H Proto Series powered by Hankook is next in action on 9-10-11 March at the Hankook 24H Silverstone in the UK.